A health bar, crunchy, delicious and a subtle combination of raw cacao and popcorn. 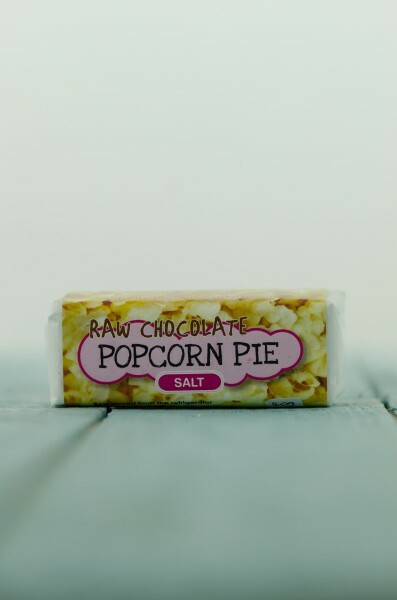 Raw Chocolate’s new popcorn pies are a real treat and just that bit different No added sugar, dairy free, gluten free, vegetarian and vegan friendly. This product contains nuts. Raw Chocolate Pie is just that…RAW – it is uncooked and therefore retains all the nutrients traditionally associated with cacao. It is suitable for vegetarians, vegans, diabetics, coeliacs and anyone with a wheat or dairy intolerance.. but most people buy it because they like it. It has a 5 month shelf life and needs to be kept in the refrigerator. Our Raw Chocolate pie is high in anti-oxidants, it is an energy boost and comes in a wide range of mouth-watering flavours.